Step 1 Trim and peel the zucchini, then use a mandoline or a vegetable peeler to thinly slice lengthwise into wide ribbons (stop when you get to the seeds). Cut the ribbons into 1/4-to-1/2-inch-wide strips to make them look like fettuccine. Transfer to a colander and toss with 3/4 teaspoon salt; let drain in the sink, tossing occasionally, about 30 minutes. Rinse well and pat dry. Step 2 Meanwhile, peel the tomatoes using a sharp vegetable peeler, then halve horizontally and squeeze out the seeds. Puree 1 tomato with the olive oil, garlic, jalapeno, and 1/4 teaspoon each salt and pepper in a food processor or blender. Transfer to a bowl. 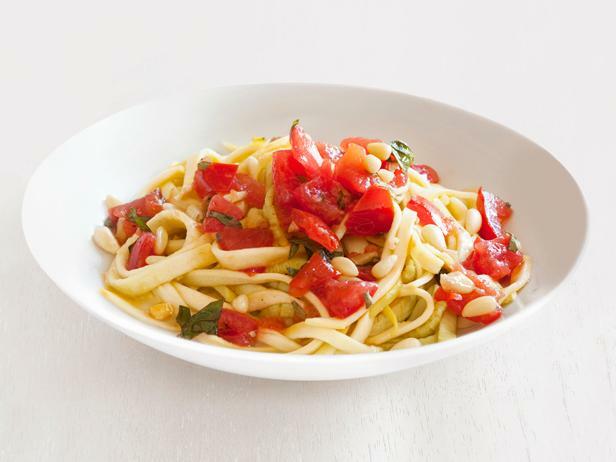 Chop the remaining 4 tomatoes and add to the bowl; add the pine nuts, basil, oregano, and salt to taste. Step 3 Divide the zucchini among bowls and top with the tomato sauce. Top with more pine nuts and drizzle with olive oil.